Why do I like Bernard Cornwell's series of 'Sharpe' novels? In my wargaming armies, I have Sharpe and Harper in two scales: 28mm and 40mm. Really enjoyed your link and the LOTR likeness with the 28mm and 40mm side by side did raise a laugh. 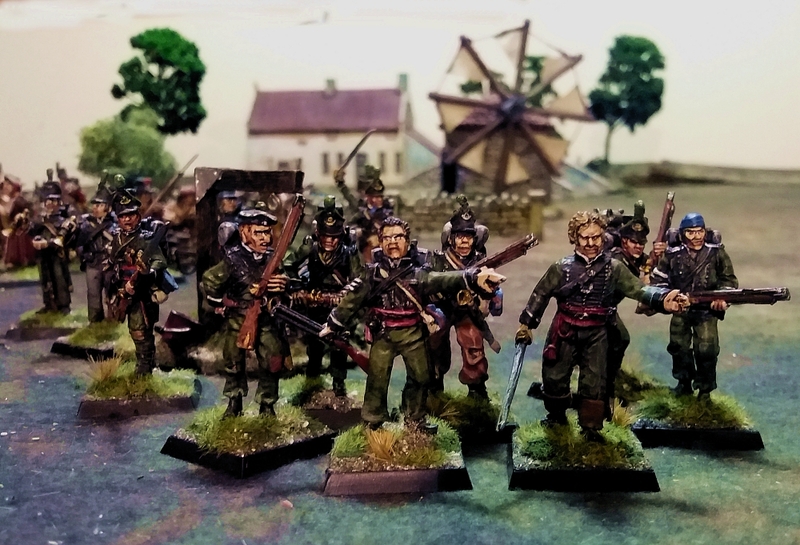 I would also mention the Brigade Games Miniatures figures, many of which do bear distinct resemblance not just to the Riflemen but some redcoats, officers and even wicked Frenchies from the TV series. Ha Ha, I never spotted the 'kissing riflemen' in that photo! Call it my contribution to Pride Week! As for the brown jacket, I can't recall the source for that, as I painted these figures some 15 years ago. But I think you're right that it is just Spanish cloth to repair a worn out jacket. Great stuff. Thanks for being so upfront about the Sharpe novels which are sometimes over criticised on this site. I throughly enjoyed the early stuff and looked forward to a new one. There are so few other napoleonic themed novels and these are a cracking read. So to the oh it's not literature brigade. Lovely photos too. Hey Roly, I've really enjoyed seeing all of the armies on parade… a fan of your blog/website for years! Can I ask… did you ever see the Sharpe short story I wrote? You might enjoy it, if you haven't! Thanks for that link, LA. I'll have a read.